While testifying before the House Judiciary Committee on Tuesday, Sessions said he has "always told the truth" during previous testimony. Not surprisingly, Russia took center stage during Attorney General Jeff Sessions' testimony before the House Judiciary Committee on Tuesday. Sessions told the lawmakers he hadn't lied in previous testimony when saying he was "not aware" of anyone in the Trump campaign being in contact with Russian officials. "My answers have not changed. 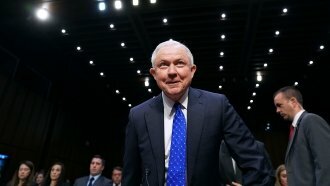 I have always told the truth, and I have answered every question as I understood them and to the best of my recollection," Sessions said in his opening statement. Sessions' testimony in October before the Senate Judiciary Committee was thrown into question after court documents relating to former Trump campaign adviser George Papadopoulos were unsealed. Those documents say in March 2016 Papadopoulos said he could facilitate a meeting between then-candidate Donald Trump and Russian President Vladimir Putin. Sessions was in attendance when Papadopoulos pitched that idea but told lawmakers Tuesday that he'd previously forgotten about that 2016 meeting. "I have no clear recollection of the details of what he said at that meeting. ... To the best of my recollection, I believe that I wanted to make clear to him that he was not authorized to represent the campaign with the Russian government, or any other foreign government, for that matter," Sessions said. When later grilled by Democratic Rep. Jerrold Nadler, Sessions said he didn't recall if Trump or anyone else in that March 2016 meeting reacted in any way to Papadopoulos' proposal.